Is St. Peter's on the way to Assisi? "Where do you go, Lord?" "I go to be crucified in your place." In a recent text that was distributed to his faithful, Fr. Herve Hygonnet, District Superior of the Fraternity of St. Peter for Belgium, puts the blame on the SSPX and—without mentioning his name—on the very words of its Superior General, Bishop Bernard Fellay. He accuses Archbishop Lefebvre's priestly society of taking itself for "the Pope's censor". Led by a "non-Catholic spirit" and "infected with a virus", the SSPX's superiors are compared to the progressivists. They are supposedly falling into "a grave error" consisting in "usurping the Supreme Magisterium" in the name of what the author considers as a misconception of Catholic obedience. It is true that very bad news has come from Rome lately: the Pope's book, that deals ambiguously, to say the least, about the use of condoms, the announcement of another congress of religions to take place next October in Assisi, and John Paul II's beatification [NB: remarks coming soon] in the beginning of May. Some insights from Fr. Benoit Wailliez, SSPX District Superior of Benelux, made on January 19, 2011. [...]Be careful about Notes on the Pope's Explanations Regarding the Condom that have been published (by the General House of the SSPX, last December 18th); and also about what has been said that some of the Pope's own words "are unacceptable" (SSPX District of France, December 24th). Regarding the Pope's intention to gather an inter-religious congress in Assisi next October, the same District of France wrote a few days ago that it was the "renewal of the scandal". So the traditionalist circles are infected by the same virus they pretend to fight: that of judging the acts and the Magisterium of the Supreme Pontiff. [...]. 1. The Priestly Fraternity of St. Peter denies itself the right, on principle, to publicly avert the faithful against any possible mistake of the Pope regarding doctrine and/or morals. This candid admission from one of their major superiors is rather worrying. 2. Already when his Jesus of Nazareth was published, Benedict XVI wrote in the preface: "Anyone is free to disagree with me." The Pope's last book Light of the World is a written interview with the Pope and therefore does not belong to the Magisterium. By the way, as a good theologian, the Pope warns us: "Naturally the Pope may have mistaken private opinions." We have noted this. 3. The Assisi Congress does not consist in an act of the Magisterium either, but in a mediatic "show"—though with a very commendable purpose (peace throughout the world)—that places de facto the only true Church of Christ on the same level as every other religion. Which implies that one may pray God in the cult of his choice and that He willingly answers such kind of prayers. Does a Catholic have the right to remain silent when confronted with such scandals? “No,” says Catholic theology. 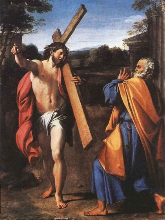 St. Paul permitted himself to rebuke St. Peter in public, who by his ambiguous attitude (to say nothing of ambiguous doctrine!) ran the risk of contradicting the teachings of the council of Jerusalem on the salvation of the Gentiles (the Mosaic Law being abrogated). "I withstood him to the face, because he was to be blamed" (Gal 2:11), thus did St. Paul act towards the Pope. St. Thomas comments: "If the faith be endangered, a subject ought to rebuke his prelate even publicly. Hence Paul, who was Peter's subject, rebuked him in public, on account of the imminent danger of scandal concerning faith" (II, II; 33, a. 4). Besides (II, II; 104, a.5), dealing with obedience: "It is written (Acts 5:29): ‘We ought to obey God rather than men.’ Now sometimes the things commanded by a superior are against God. Therefore superiors are not to be obeyed in all things." How could the inferior determine whether some of his superiors' teachings or doings are against God, if not by making a prudent judgment, guided by the light of the Faith that his catechism (among others) teaches him. This was Archbishop Lefebvre's teaching. Furthermore, the history of the Church recalls many acts of resistance against legitimate authorities when they somehow abused their power, in matters of doctrine or discipline: St. Hilary and St. Athanasius resisted Pope Liberius (4th century) during the Arian crisis; Pope Vigilius is put in his place by the deacon Pelagius (4th century) on the subject of monothelism; Boniface IV by St. Columbanus (7th century); Honorius by St. Sophronius of Jerusalem (7th century); and there are the examples of St. Bruno (against Pope Pascalus II), of St. Thomas Becket (against Pope Alexander III) and of St. Catherine of Sienna (against Gregory XI and Urban VI). Is it a "usurpation of the Supreme Magisterium", and have all these holy figures shown any "non-Catholic spirit"? One may remember too that in 1983 Archbishop Lefebvre and Bishop de Castro Mayer addressed to Pope John Paul II a public letter referring explicitly to St. Paul's and St. Thomas's teaching. The SSPX in no way intends to "break off its relations with Peter". Rome does pay attention to our objections on the doctrine and on conciliar and post-conciliar orientations (cf. the current doctrinal discussions). Moreover, it is certainly because of the various scandalized reactions (from the SSPX, but also from the episcopal conference of Kenya and from several theologians nevertheless known as "Ratzingerians") that the Congregation for the Doctrine of the Faith intervened and clarified the ambiguous words of the Pope regarding the use of condoms. Hence it is proof of a Catholic spirit to resist the legitimate authority, frontally and respectfully, in order to remain immutably attached to the Church and to her traditional teaching.